Spanish is the second most widely-spoken language in the world after English, so the subject offers huge geographical, cultural and historical scope alongside the ability to become linguistically proficient. Spanish plays an important role in the Assumption Grammar School’s Modern Language provision, and is studied by all pupils in their first year. Thereafter, many pupils choose to continue to study Spanish. There are four staff members employed in the Spanish Department: Mr J. Leonard (HOD), Mrs M. Lewis (Head of Middle School) and Mrs L. Patton (Teacher of Spanish and French). María Francisca is Auxiliar de Español for the academic year 2014-15. Our aim is to develop an interest in Spanish and to foster broader linguistic skills, as well as giving our pupils an insight into Spain, a country they may well visit on holiday. Spanish is available at GCSE, AS & A2 levels and a significant number of pupils choose to continue with their studies of the language at university level, either as a single honours degree, a joint degree with, for example, another language, Business Studies, Law, History, English or Music. For others, Spanish complements their studies of other subjects in school and enriches their understanding of the world. 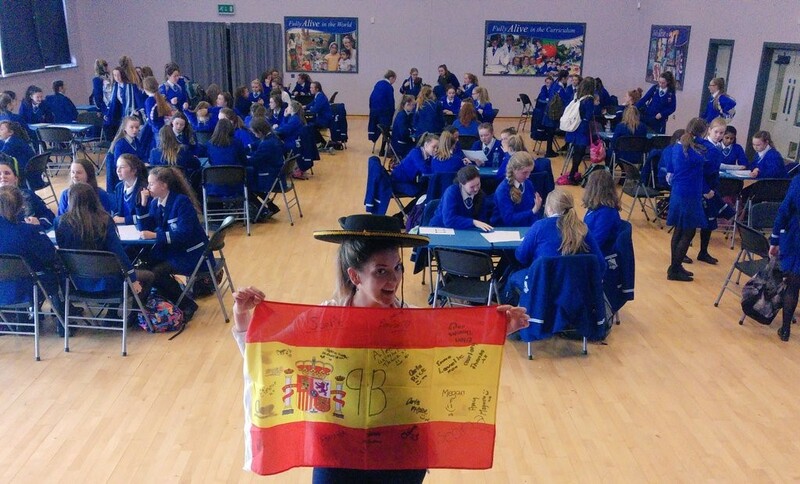 All Year 8 pupils study Spanish. Pupils are introduced to the new language. Lessons focus on building confidence in speaking and writing in Spanish as well as helping pupils to become independent language learners. 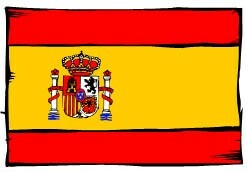 Pupils may attend “El club de Español” in the Autumn term. Having chosen to continue Spanish for a second year, pupils will be exposed to and expected to use a greater amount of language in their written and oral work. In Assumption GS, lesson provision in Year 10 is excellent – with five lessons in Spanish per week. This time allows pupils to really improve their active and passive language skills and to possess a solid foundation in the knowledge language and structures which are required of pupils at GCSE. In Assumption GS, pupils sit GCSEs set by AQA. There are four assessment units which test the pupils’ skills in reading, listening, speaking and writing. Pupils carry out controlled assessments at intervals through Years 11 & 12 and sit the Reading and Listening Comprehension Examinations in May / June of Year 12. Normally pupils are entered for the Higher Tier examinations but, where it is thought to be a wiser option, pupils may be entered for Foundation Tier following agreement with their parents. A schedule of Controlled Assessments is given below as a guide. More precise timings are given to pupils as the school year progresses. Spanish has been gaining ground across the world. After Mandarin Chinese, it is the most spoken mother tongue, with more than 500 million speakers in Europe, South and Central America, the United States and is fast becoming a rival to English as the language of communication. The Spanish A level course gives you a solid grounding in the language, taking you from GCSE level to university level. The course and exam are designed to equip the student with the skills that will enable them to tackle the contemporary society topics that form the basis of the challenging A2 exam in Year 14. Before embarking on the course pupils will need to feel confident at this level in the four language skills of Listening, Reading, Writing, and Speaking. You need to be interested in developing this understanding and in exploring in much more depth the topic areas that you will have covered at GCSE and new cultural and societal themes. We have very much enjoyed our long-term connection with the IES Alto Conquero, a mixed secondary school in Huelva. (http://www.juntadeandalucia.es/averroes/ies_altoconquero/). This link was set up in 1992 and has continued since then, enabling us to travel to Huelva on a number of occasions, stay in pupils’ houses and meet up for cultural and social activities. 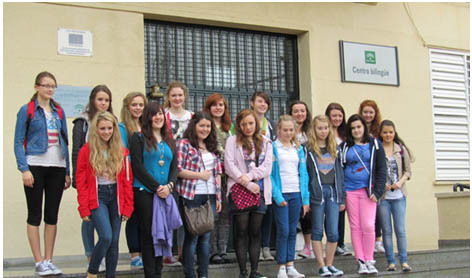 More recently we have stayed in a hotel and visited the school and local area. 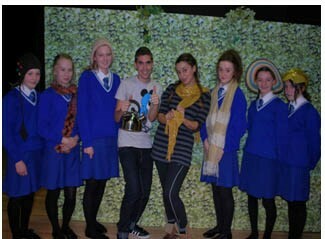 The staff and pupils have also visited us regularly, most recently twice in 2009. We hope to receive pupils from Spain later in this current academic year; our next visit is planned for October 2013.
http://oye.languageskills.co.uk/index.html a variety of different language activities: Spanish, French, German and Welsh! http://www.sunderlandschools.org/mfl-sunderland/resources.htm a variety of different language activities: Spanish, French, German and Italian!